On June 5, 2002, Elizabeth Smart vanished from her home and left little trace. A manhunt ensued for the 14-year-old girl, but no one had any idea what she was going through. She was kidnapped by Brian David Mitchell and held captive in the woods with the help of Wanda Barzee for 9 months. She was raped every day, sometimes twice a day, starved, beaten, and restrained into submission. Brian attempted to rename Elizabeth, but she renamed herself, Ester. Ester was the 2nd wife who tricked the king without a weapon. Since she could not overpower her captors, she had to outsmart them. Winning their trust by doing chores and listening, Elizabeth waited for the first chance of manipulation and escape. She was there as Brian and Wanda’s relationship deteriorated and jealousy took hold. But her tenacity, patience, and faith made her rescue possible. Based on the autobiography My Story by Elizabeth A. Smart, this is a painful yet necessary story (FTC Affiliate Disclaimer). The most painful scenes are cut just in time for the real Elizabeth to narrate her own terror. The pain she endured while hearing people search for her, withstanding the holidays without family, and screaming silently for help was unbearable. This story will hopefully put an end to victim blaming and start perpetrator shaming. This movie speaks of survival and finding hope in the smallest thing. Elizabeth found hope in a cup of water, rain, and a safety pin. Elizabeth’s story should be seen by everyone and she hopes you will never understand. Because understanding only comes from experience. Dante is the son of a Bishop T.K. Wilson and First Lady Charlene Wilson and brother to his younger sister Donna. He dreams of being a lawyer even though his mother has him on a preacher’s path. So much so, she secretly applied for him to go to Howard University Divinity school and he got in. But he hasn’t told his mom he got into law school too. After calling off his affair with a married woman named Anita, Dante meets Tanisha; down on her luck with a little brother and drug-addicted mother. Dante helps her in 2 separate acts of kindness and he asks her out on a date. After two dates, they are smitten with each other, but Tanisha is holding back a secret from the preacher’s son, she is a stripper. But Tanisha is not the only one with secrets. Donna is pregnant but refuses to tell her parents whom father the child. And the father of her baby is a wolf in sheep’s clothing. During a wedding, everything comes to the surface causing everyone’s secrets and lies are exposed. Based on The Preacher’s Son by Carl Weber, this movie will leave you speechless (FTC Affiliate Disclaimer). You will want to watch this more than once so get your DVRs ready. During the wedding and church meeting, so much is revealed your head will spin. OMG and WTF are understatements. This movie could have been a soap opera with everything happening. On the downside, it was difficult to understand somethings being said because the backing track was drowning out the actors. Also, some of the camera work was too shaky. Otherwise, the actors created extraordinary performances and the screenplay was well adapted. Get your wine ready and be sure not to spill it. After witnessing a crime, Sarah is completely in shock. Her mother is now in the hospital fighting for her life and Sarah needs a place to stay until she can testify against a dangerous hitman. While waiting for arrangements to be made, Sarah becomes comfortable with Heather. Heather is a tough cop who was born into her job. And she doesn’t like kids. So, when Sarah ask for Heather to be her police detail, Heather is at a loss for words. Heather’s boss explains that if witness protection goes well, she can get a promotion. Heather is on board. But with a dangerous killer stalking Sarah and Sarah missing her mother, something’s got to give. Will it be the killer’s freedom or Sarah’s life? Slow and uninspired are the 2 words needed to describe this movie. Shocking moments were predictable and fight scenes were not well executed. The movie is missing a wow factor to keep you tuned in. So DVR his movie to use fast forward or make it background noise. It’s been over 7 weeks since Ian and Miranda have seen each other and a year since Miranda has seen the Whitcombs. She is looking forward to going to Carlton Heath and seeing everyone again. While at the airport waiting for Ian, she runs into her old boyfriend Josh. After a brief discussion, Miranda tells Josh her secret: the actor James Whitcomb is her father. Josh is shocked but promised to keep her secret. Once Miranda is back in Boston she starts getting “unknown” phone calls and text. She ignores them and focuses on Ian and her family. It difficult to be a “family friend” instead of a sister but she doesn’t to lose her connection to her father. So she keeps the family secret. With everything going on, Miranda’s love for Ian deepens when he pops the question. She is ready to start a life with him in Boston, but she keeps getting texts. But the latest one shakes her faith in family, grace, and truth. Can the Whitcombs handle the exposure? Will Miranda lose the only connection to her father? Based on the book Engaging Father Christmas by Robin Jones Gunn, this movie is just as intriguing as the first (FTC Affiliate Disclaimer). The first was about finding her father, but the second is about engaging with her new found family. However, in order to keep James Whitcomb’s public persona, she is asked to keep quiet or play the “family friend” in interviews. As a viewer, it’s hard to watch or feels like a rejection. This conflict makes a good movie great. While they all love each other, the elephant in the room is hard to ignore. Even her nephew has an opinion. However, the mystery lies in who is sending the text messages to Miranda. Is it Josh (the ex), Josh’s brother, or the Rachel (the Whitcomb’s reporter)? Experienced Hallmark watchers will see the culprit a mile away but that’s not the end. It’s only the beginning. This movie is a wonderful addition to the series. Laura is ready to settle down for the holidays with her daughter Nikki. But her boss Oliver has an announcement. He has purchased a new hotel called the Enchanted Lodge and with 8 weeks of work needed, she has 4 weeks to get it done. It needs to be done before the town’s Enchanted Christmas Show. This show has always been hosted at the hotel, which Laura knows all too well. She grew up in Rosemont, Utah and danced in the show every year with her partner Ricardo. She doesn’t want to go back to Utah and the old memories but she must in order to keep her job. She is encouraged by her boyfriend Scott to go and hopes the job can be completed quickly. But Laura doesn’t know that Ricardo is back in Utah to help with the show. It’s only a matter of time before the two run into each other. Will this be their last dance or will the two tango again? Sweet yet predictable. This movie falls into the same plot as most Hallmark movies so the journey must be new and intriguing. This one just falls flat. There was a moment when Eddie, Scott, and Ricardo were all in the same room surrounding Laura asking questions. This was a prime opportunity to have back and forth comments (not fighting, but slide comments), but this never happened. This movie is background noise, nothing more. You know how it starts, climaxes, and ends. Country music star Adelaide feels like a puppet for her manager Russell. Russell wants her to sing songs she hates, lie about dating another star, and eat what he wants her to eat. Adelaide wants to write her own songs but her first album flopped. So Russell wants her to continue on the path he has worked out for her rising career. After a night in a B&B, Adelaide is overlooked and accidentally left behind. She gets help for a local girl named Hailey who offers her a phone call and a place to sit. But when Adelaide is stuck for several days, Hailey and her family offer Adelaide (now being called Addy) a place to stay. Addy learns that Hailey’s brother Dillon dreams of singing but can’t get over his fears. While his family supports him singing, he doesn’t want to leave because the family farm is about to be foreclosed. The family hasn’t given up hope but they only have to the end of the month to turn things around. Addy wants to help Dillian and the family farm but she knows their pride will stop her. She must do everything she can to help the family without offering money. “A Farm for Christmas” feels like a better title for this film. The song itself feels like a subplot for this movie, not the main storyline. You will find yourself more concerned about this nice family and how they will keep their farm. This is a story that is affecting so many farmers today that you focus that and not the love story. While the song is not your focus, it is a good song that was sung by both the actors. They are just as amazing acting as they are singing. DVR and watch this movie when you have a moment. Kylie is having a rough year. She lost her job as a pastry chef, can’t find work at another restaurant, was turned down for a business loan, and moved in with her sister Tina. Kylie hopes that things will get better because her boyfriend Alex is preparing a special dinner. When what she believes to be an engagement dinner turns into a promotion dinner, she breaks up with Alex. Then Kylie gets good news, she is a semifinalist in the American Ginger Bread competition. The grand prize is $25,000. This will cover her student loan debt and help start her online baking company. However, when her sister’s oven burns out, with resistance, she asks the one person she believes can help; her ex-boyfriend Nick. Still carrying a torch for her, he agrees. If Kylie thought the competition would be her single biggest source of stress, she has no idea what’s to come. “This time is going to be different” is a very important phrase in this movie. 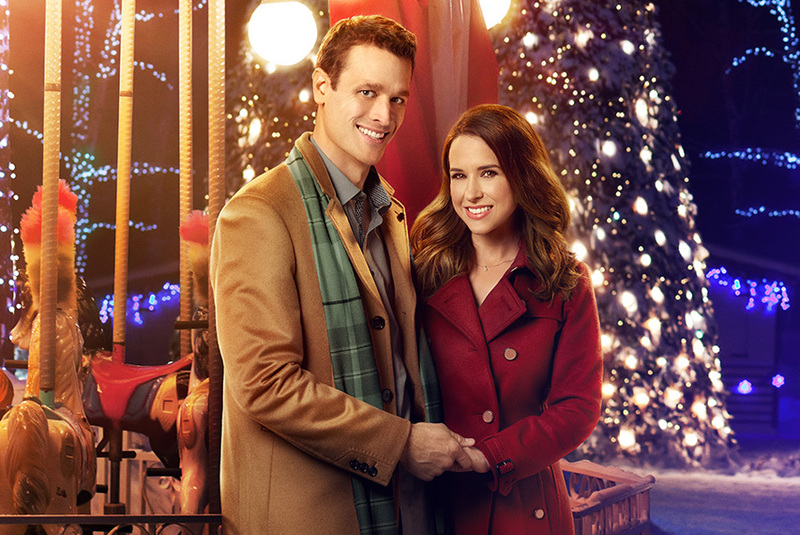 And for Hallmark, this movie is different. She doesn’t go to the restaurant to get dumped, she dumps the inattentive boyfriend. She doesn’t hate Nick at first, she has always loved him. Also, her final gingerbread entry isn’t perfect “for TV”. It looks like a real entry made by a real person. With a lot of heart-warming moments, you will be given plenty of laughs with Ralphie and Bobby’s banter. No one can match their quick and honest quips. Just to warn you, have gingerbread and hot cocoa close by. #AtomicBlonde, #TheNutJob2, and #WindRiver- Review Repost – In Stores Now!! !